Thailand wants to join the Trans-Pacific Partnership "as soon as possible," Deputy Prime Minister Somkid Jatusripitak told visiting Japanese Economic and Fiscal Policy and Revitalization Minister Toshimitsu Motegi who is in charge of negotiations for the pact on Tuesday. Thailand had previously expressed interest in joining the free trade deal between 11 nations but had hung back after President Donald Trump pulled the US out of the pact as soon as he took office in 2017. Thai ministries are now studying the impact of joining the bloc on the local economy. 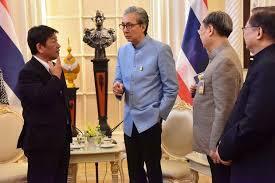 Thailand, whose economy largely depends on exports, hopes to expand trade through the deal. According to commerce ministry statistics, exports from Thailand to TPP members reached $70 billion in 2017, accounting for roughly 30% of total exports. Exports to the US, meanwhile, made up only around 10% of the total. 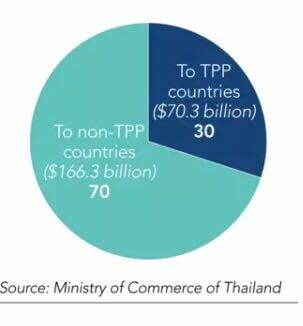 Among the 11 TPP countries, Canada and Mexico do not have a free trade agreement with Thailand. If Thailand joins the agreement, it would become the fifth Southeast Asian nation to do so. Singapore, Malaysia, Vietnam and Brunei are among the original 11 members. Thailand’s participation would likely push other exporting countries in the region like Indonesia and Philippines into the deal too. Motegi said that Japan "welcomes" Thailand’s intentions and promised to "cooperate" in getting the country a place at the table. "We hope that an expanded TPP will help bring the US back into the deal," Motegi told reporters after his meeting with Somkid. Japanese Prime Minister Shinzo Abe met with Trump earlier this month to encourage the US to return to negotiations, but Trump dismissed it by saying that he preferred bilateral trade deals. Official talks for inviting new members, however, can only start when the TPP comes into effect. Currently, implementation is targeted for early 2019. Diplomatic sources say it is too early to tell if Thailand will really join the pact as a general election is planned for February. The election will bring the military-ruled country under an elected government for the first time in more than four years. After the US withdrawal from TPP, some Southeast Asian countries had been banking on the Regional Comprehensive Economic Partnership, a 16-nation trade pact that involves all 10 members of the Association of Southeast Asian Nations, India, China, South Korea, Japan, Australia and New Zealand. However, negotiations, which started in 2013, have yet to result in agreement. India, for example, is reluctant to reduce tariffs on its agricultural products while others such as New Zealand and Australia are demanding a more open market. As negotiations stall, some are losing patience. Ideas for an alternative framework, such as a 13-nation deal excluding India, Australia and New Zealand, have been floating among ASEAN member countries such as Thailand and Malaysia.